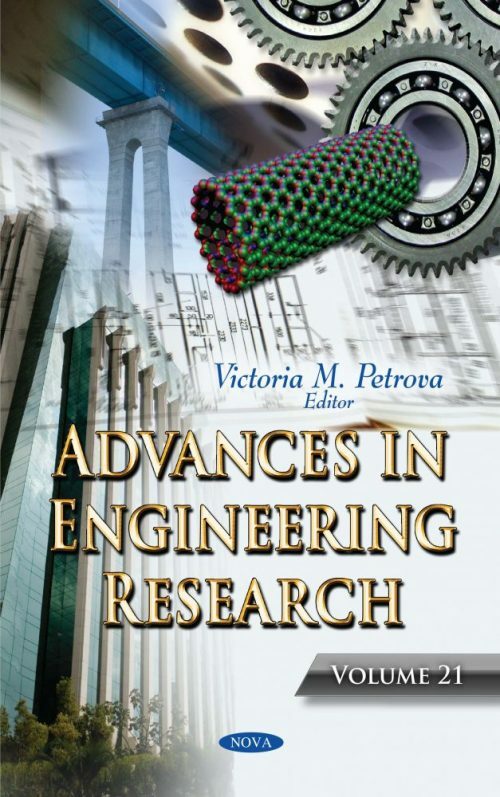 Advances in Engineering Research. Volume 21 opens with a review of some basic theoretical elements of DES and case studies related to construction process and maintenance management, which can illustrate the practical benefits of this discrete event simulation. Afterwards, the authors propose a low cost ultrasonic planar anemometer that is achieved by introducing an Arduino based architecture. The preliminary design and calibration results and experimental activities are described. Additionally, the authors establish a closed-form analytical model based on the TOM modified shear-lag model (Tsai-Oplinger-Morton), considering the existence of a void within the adhesive joint was established for a fixed-free double lap bonded joint under static axial force. In a separate paper, the E-filter requirements of Nyquist WDM signal generation are evaluated with spectral pre-emphasis for system performance convergence with high-level modulation formats; the required optical-signal-to-noise ratio (OSNR) for a 10-3 bit error rate (BER) is assessed as a function of channel spacing and DAC resolution. Later, the authors analyze the forecasting of residential load demand, using Auto Regressive with Exogenous Inputs, Artificial Neural Networks and Artificial Neural Networks optimized by Genetic Algorithm. Artificial Neural Networks optimized by Genetic Algorithm achieved the best results. A study is presented in which a WEB inquiry platform of fishery output value is designed. The authors also analyze the yield of fishery to determine whether it is needed to increase the catch volume and to help fishery management to make decisions about catching and fishing moratorium. In this book, new compositions of silicone pressure-sensitive adhesives with terpenes are presented. Based on this, Si-PSA with low viscosity exhibit increased tack and decreased adhesion, cohesion, viscosity, and shrinkage compared to pure compositions. The authors propose group robotics, using the humanoid robot as an experimental platform for developing the system with vision, speech and motion combination. The idea of a flexible service robot is proposed. This design includes a system with the vision-guided system embedded in it to for obstacle avoidance. In the closing study, the analytical expressions of both the electric and magnetic field for surface wave propagation are derived through calculated Hertz potentials. The influence of key parameters that determine the behavior of graphene on the SPP propagation characteristics is comprehensively explored, and the analysis is extended to magnetically biased graphene sheets.